At the end of the YouTube Challenge Awards, Jeremy Grunin said, "I am excited to announce The Foundation will be building on tonight's success with the $10,000 Engage Toms River Community Mural Project. This is a competitive competition for proposals open to all artists resident in Ocean County." 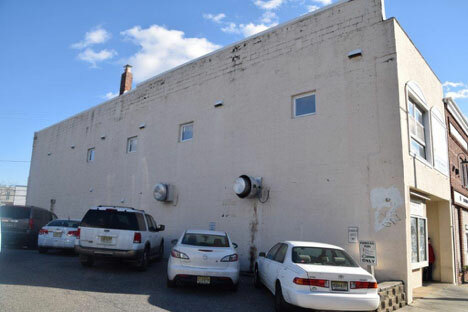 Pointing to a photo of Nancy's Café in Downtown Toms River, located at 207 Main St., Jeremy continued, "To me this is an ugly wall, but to the artists in our community, it's their canvas. This is an incredible opportunity for artists to begin redefining Downtown Toms River. It will also give the winner an opportunity to gain experience seeing a project from design to installation. We are looking forward to see the talent of Ocean County come to the fore over the next seven weeks." Jay Grunin stated, "Toms River has world renowned artists who were born and raised here. We are proud to announce our Juror Co-Chairs are Danny Clinch, internationally acclaimed rock photographer and Brian Hanlon, Official Sculpture of the NBA. It is our hope the Foundation's Engage Toms River endeavors will inspire a new generation of world class artists." Speaking at the launch, Yvonne Yaar, the artist behind last year's Community Mural Project stated, "This is an extraordinary opportunity for the artistic community of Ocean County. There is no submission fee and the subject matter is open to the artist. It is the competition every artist dreams of." The top three mural designs chosen by the jurors will be announced on March 16th. The voting will then be open to the public to vote for their favorite design with the top three mural designs shown on www.jayandlindagruninfoundation.org, www.wobm.com, The Jay and Linda Grunin Arts Center at Ocean County College, Toms River Branch of the Ocean County Library, Community Medical Center, and The River Market Restaurant in Downtown Toms River. The overall winner of the $10,000 Engage Toms River Community Mural Project will be announced on March 30th. Zarita Mattox, Executive Director of the Toms River Branch, Ocean County Library said, "The Engage Toms River Community Mural Project is community in every sense of the word. The winning design will be turned into a "paint by numbers" canvas allowing every visitor to the Toms River Branch of the Ocean County Library the opportunity to paint the mural. We are looking forward to a very busy and artistic spring!" Visit www.jayandlindagruninfoundation.org for more information. The Jay and Linda Grunin Foundation is a private family philanthropic organization based in Toms River, NJ. Its aim is to make Toms River the regional template for quality of life and strong economic health through root-cause focused investment in health care, education and the arts. To demonstrate our commitment to sustained engagement and participation of all of Toms River's residents in the arts, it developed the Engage Toms River Program. Engage Toms River (#EngageTomsRiver) will become the hub of the community's creative ingenuity. The Foundation wants to encourage every citizen in Toms River to awaken his or her creativity, individuality, artistic and technical abilities to embed interaction with the arts and culture in the community. The Foundation will host two to three Engage Toms River programs every year, open to everyone in Toms River AND with a minimum prize of $10,000. Engage Toms River programs will range from digital to performing arts, from music to architecture, sculpture to paint and everything in between. There will be something for everybody in our community.